Sorry for completely missing out to blog about Promoes last two songs of the month. 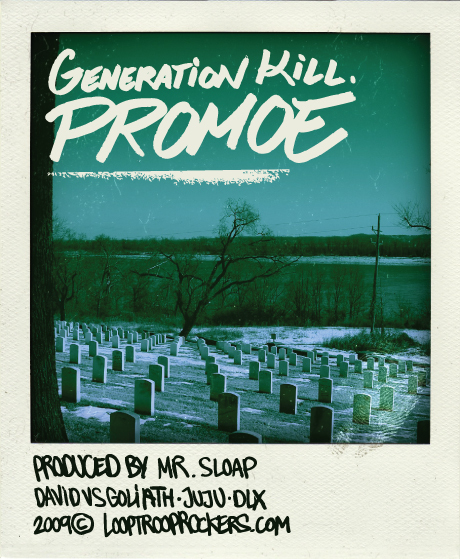 But better late then never I suppose and hey, Promoe is one month late with a track! The track for July is called “Dressed To Kill Under A Full Moon” and the beat is signed Jimmy Ledrac who also produced “Sunday Morning“. The variation of the tracks sound is kinda wide which is highly appreciated. 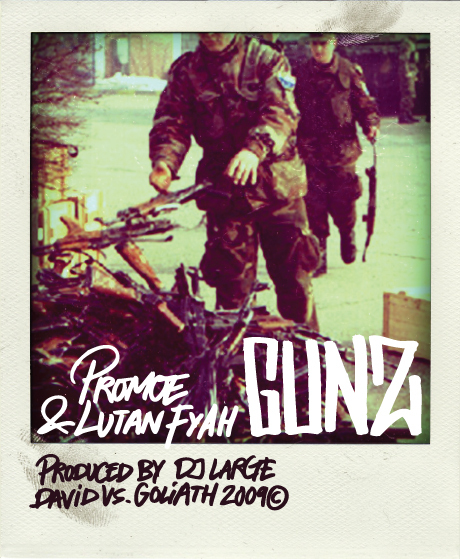 For August we have “Gunz” featuring no other than the jamaican reggae artist Lutan Fyah. The title itself gives you a great hint what the track is about and Dj Large gives you that classic reggae vibe to it. Makes me go back and spin Promoes album “Long Distance Runner“. This entry was posted in Nyheter and tagged David vs Goliath, dj large, DLX Entertainment, Jimmy Ledrac, JuJu Records, Lutan Fyah, Promoe, Song of the month on October 7, 2009 by Niklas. … but can we blame the children when they kill the children / and can we blame the young men when they become the gun men / when we create the monster but let’s expose the sponsor / cus i wanna know who’s responsible. Finally the song of the month for June by Promoe has arrived from the Basecamp Studios. This time the song of the month is produced by Mr Sloap, a riddim/reggae producer based in Skåne, Sweden. Hanouneh, who is completely unknown for me, is backing up on the vocals and she pulls it off great. According to her MySpace profile she is a former jazz vocalist who has moved on to reggae and hip hop with a political message in her songs. She and Mr Sloap runs a label together called DonDada where they produces and distrubuting reggae and dancehall music. This entry was posted in Nyheter and tagged Astma, Basecamp Studios, David vs Goliath, DLX Entertainment, DonDada, Generation Kill, Hanouneh, JuJu Records, Mr Sloap, Promoe, Song of the month on June 21, 2009 by Niklas. A great statement by Promoe for all fans that have started to doubt on him since he released the controversial track “Svennebanan“. Anyhow, Promoe has released a new song every month from his hopefully upcoming english album (not to be mistaked with his swedish album “Kråksången”) during 2009. 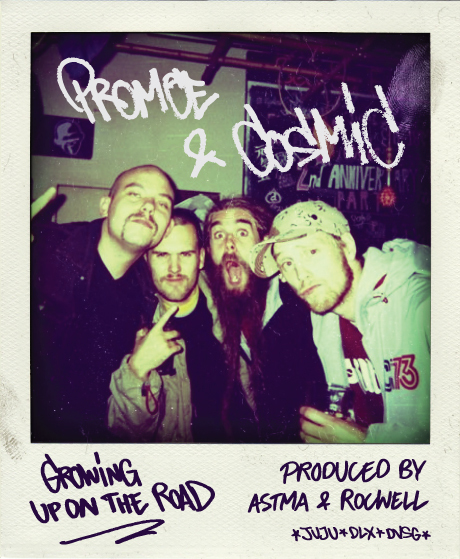 April’s song of the month featuring no other than former Looptroop Rockers-member CosMIC! Definitely a warm welcoming this spring. The title explains the track fair enough and I love hearing them both on a typical Astma & Rocwell-production like this one. You can also find the lyrics and .wav-format at Looptroop Rockers own website. This entry was posted in Nyheter and tagged Astma & Rocwell, Cosmic, DLX Entertainment, DVSG, Growin Up On The Road, JuJu Records, Promoe, Song of the month on April 19, 2009 by Niklas. Promoe is also sharing a track that he recorded in 2005 together with Cosmic and Tenor Diamond. The track is called “Bureaucrazy” and for those of you who haven’t heard it before I really recommend you to download it! This entry was posted in Nyheter and tagged Astma, Astma & Rocwell, Bureaucrazy, Cosmic, DVSG, JuJu Records, Looptroop Rockers, Michel Rocwell, Promoe, Song of the month, Tenor Diamond, The Logic of Dreams on March 4, 2009 by Daniel. It’s a new year, it’s a new beginning, it’s a new song called ‘New Day’. Promoe writes about the future at Looptroop Rocker’s own blog and lets us all know that his highly anticipated first solo record in Swedish will be released this spring. Also, Embee is currently working with his own solo material and obviously it’s two records in the making..
Another great year a head with exciting releases from DvsG! But until then can we kick back this day after New Years Eve and listen to Promoe’s new song “New Day” produced by Astma & Rocwell from the DLX family. It’s released in co-operation with JuJu, DvsG and DLX Entertainment. This entry was posted in Nyheter and tagged Astma, DLX, DVSG, Embee, JuJu Records, New Day, Promoe, Rocwell, Song of the month on January 1, 2009 by Niklas.